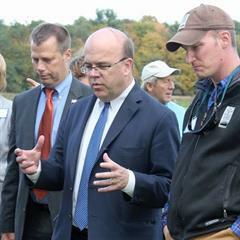 Congressman Jim McGovern was born in Worcester on November 20, 1959 and grew up around the corner from his current home on Burncoat Street. Growing up in Worcester taught Jim a lot about the value of hard work and giving back to his community. Jim helped stock shelves at McGovern’s Package Store, a small business owned by his family since 1937. He attended Burncoat Elementary School and then Worcester Academy. By seventh grade, Jim knew he wanted to make a difference. He volunteered on the 1972 presidential campaign of Senator George McGovern (D-SD) – no relation – and held signs and knocked doors for the Senator’s anti-war campaign. Later, he managed Senator McGovern’s second presidential campaign in Massachusetts, delivering his 1984 nominating speech during the Democratic National Convention in San Francisco. Jim attended The American University in Washington, D.C. where he earned both his bachelor’s degree in History (‘81) and his Master’s Degree in Public Administration (‘84). He worked his way through college as an intern in the office of Senator George McGovern. Jim worked for Massachusetts Congressman John Joseph Moakley (D-South Boston) from 1982 until 1996, serving as a staff assistant, press secretary, and legislative director. In 1989, Congressman Moakley asked Jim to be the lead staffer in the investigation of the murders of six Jesuit priests, their housekeeper and her daughter in El Salvador. He exposed that the murders were committed by the U.S. – backed Salvadoran military, leading to a major shift in U.S. foreign policy. After Jim’s discovery, future military aid from the U.S. was contingent on improved human rights and a negotiated peace in El Salvador. It was while working in Moakley’s office that Jim met his wife, Lisa Murray McGovern, who was an aide to Congressman Gerry Studds (D-MA). The McGoverns married in 1989 and have two children, Patrick and Molly. Jim was elected to the House of Representatives in 1996, and through his work in Washington and at home in Massachusetts, he has been a voice for the most vulnerable and a strong advocate for working families. In 2001, Jim was appointed to a seat on the powerful House Rules Committee, “the traffic cop of Congress” which sets the terms for debate on most legislation. Jim is now the Ranking Member of the Rules Committee. During his time in Congress, Jim’s top priority has always been his constituents back home. He has been an advocate for making college more affordable, and authored a bill to increase Pell Grant funding. To protect open space for future generations to enjoy and enhance recreational community spaces in urban and suburban neighborhoods, Jim successfully fought to defend the Land and Water Conservation Fund, which provides grants to preserve open space. Jim authored legislation to give tax credits to employers who pay the salaries of National Guard members and Reservists called to active duty. And when the Supreme Court handed down its flawed Citizen’s United decision to allow unlimited amounts of money in politics, Jim introduced several Constitutional Amendments to overturn the court’s decision. Jim is co-chair of the bipartisan Tom Lantos Human Rights Commission, which investigates international human rights abuses and recommends how the U.S. should foster respect for democratic values abroad. In this role, he has held a spotlight to egregious international human rights violations that would have otherwise have gone largely unnoticed. In 2012, Jim authored the Sergei Magnitsky Rule of Law Accountability Act, which allows the President to punish foreign officials who the U.S. identifies as corrupt or human rights abusers. The bill was passed by the Senate later that year and signed into law by President Obama. As a leading advocate in Congress for peace, Jim has repeatedly called attention to the lack of Congressional oversight and approval of America’s wars in Afghanistan, Iraq, and Syria. Throughout his career, Jim has been a voice for reallocating defense spending towards domestic priorities like education, infrastructure, and supporting our veterans and seniors. One of Jim’s greatest passions is ending hunger at home and abroad. He is the founder and co-chair of the House Hunger Caucus and Ranking Member on the House Subcommittee on Nutrition, where he advocates tirelessly for funding programs that help working families, children, and the elderly put food on the table when times are tough. He also authored the McGovern-Dole International Food for Education and Child Nutrition Program to provide school-based meals for millions of children in some of the world’s poorest countries. 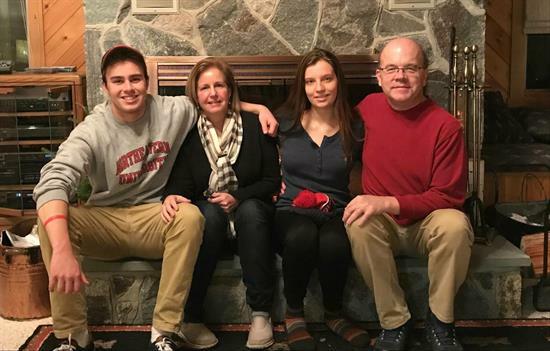 Jim’s work on behalf of Massachusetts and the nation has a proven record of success and he is proud to represent Massachusetts’ Second Congressional District in Washington, D.C.
Click here for a full list of Committees and Caucuses Congressman McGovern belongs to.